A day trip to Salamina island is an easy and beautiful getaway from Athens. A 15-minute ferry and one euro will get you there. 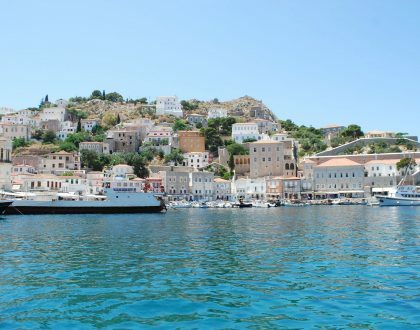 A 15-minute ferry ride – yes, 15 minutes – and a one euro – yes, one euro – ticket gets you to a Greek island. That Greek island is called Salamis or Salamina. 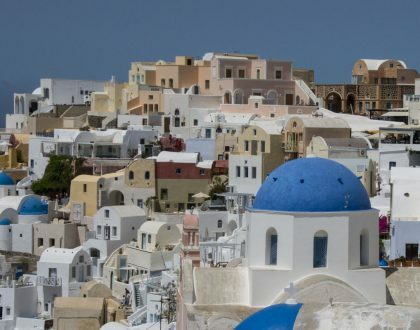 It’s not a famous island like Mykonos, Crete or Santorini. It’s even kept out of the loop when compared to its sister Saronic islands like Aegina, Agistri or Hydra. That’s because, as I found out, Salamina is not the kind of island destination that requires a lot of planning. It’s a simple kind of island where many working class Athenians head out for the weekend to get away from city life at their summer cottages. 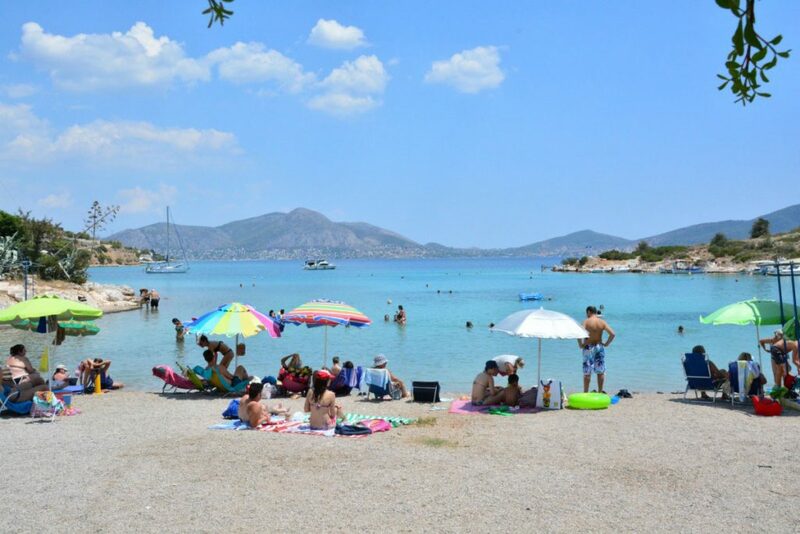 As a visitor, that’s what you’ll encounter – the typical Athenian beach weekend. 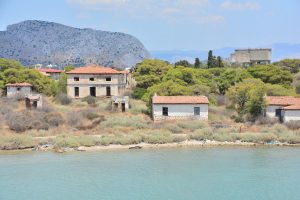 Exploring Salamina for a day, I discovered a bit of its character — an Athens city suburb that broke off on its own into the sea. Nothing posh or catered to tourists. No tours or red buses. No tourist shops. 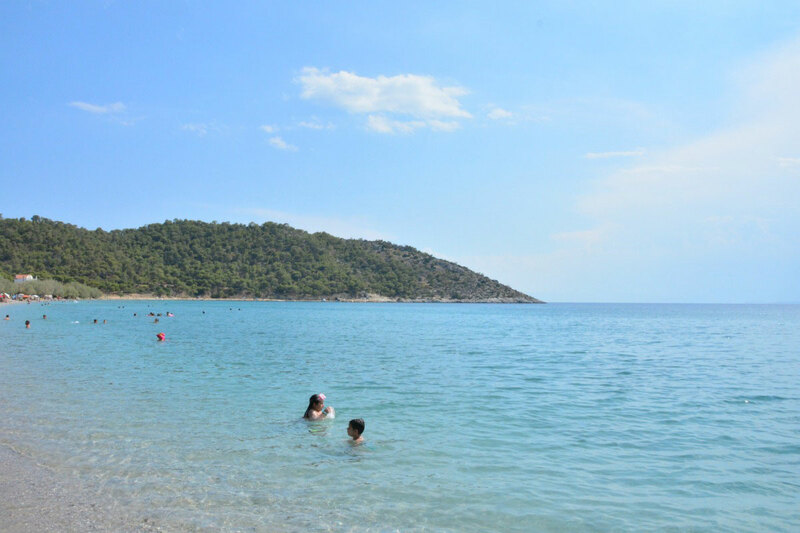 The island is dotted with simple summer cottages, cheap but authentic tavernas and some stunning beaches. Even if you wanted to stay overnight, there aren’t many hotels or rooms for rent. For a visitor, it is the easiest of day trips. 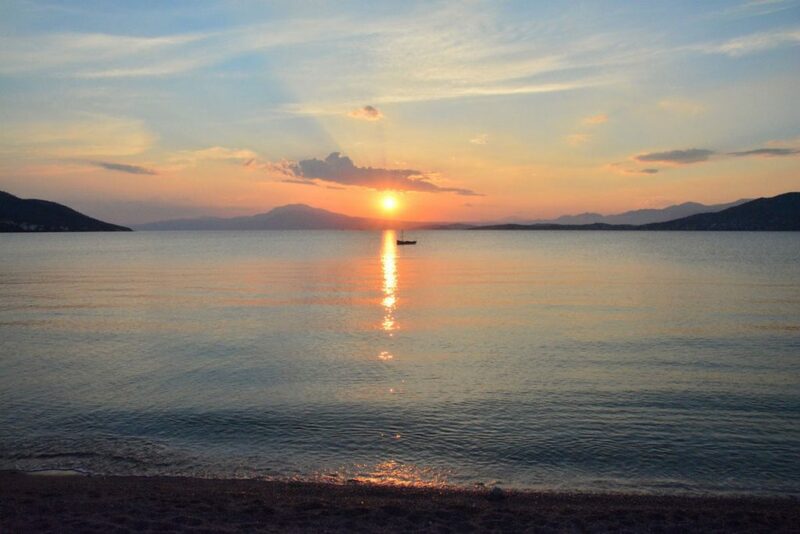 With a car and a day ahead of you, you can check out what Salamina has to offer. 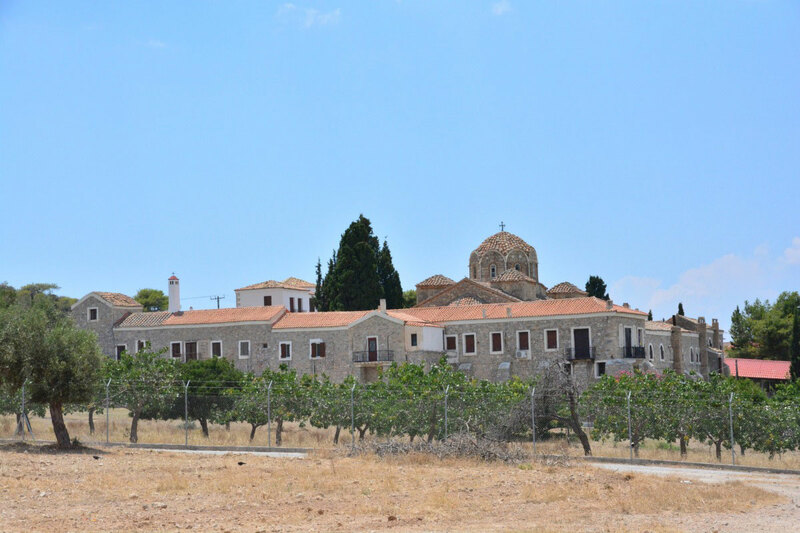 Stefanos hadn’t been to Salamina for a long time, and I was eager to see a new Greek island. We packed up the motorcycle for a day-long excursion to the closest island to Athens. 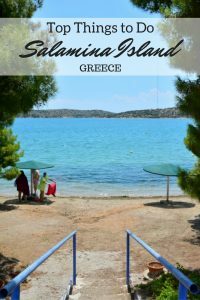 Here are the highlights of our day trip to Salamina island. 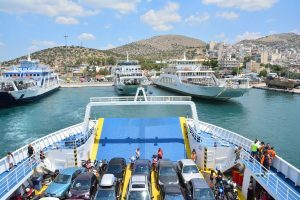 It was incredibly easy and quick to get to Salamina from Athens. Basically, you need to get to the port of Perama which is west of the port of Piraeus. 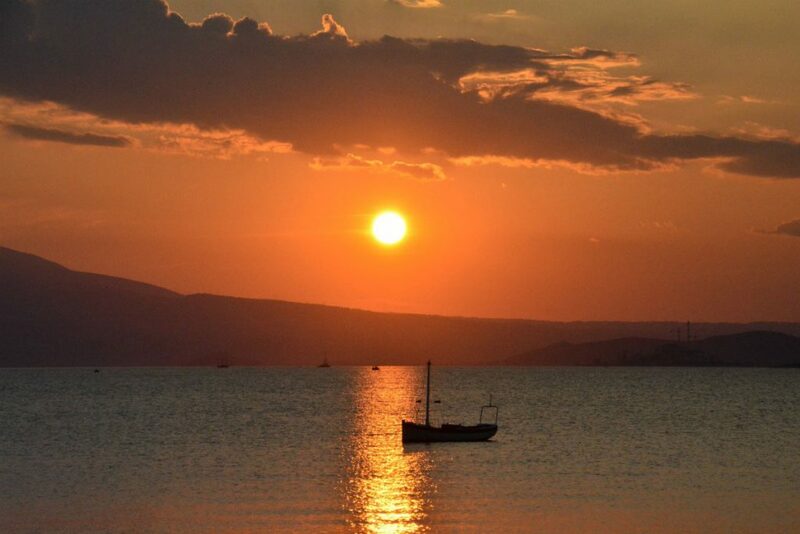 Simply hop on the next ferry shuttle that leaves for Salamina’s Paloukia port. There was a constant line, an organized queue of cars, motorcycles and people boarding a ferry. Each ferry, especially designed to take on a load of cars, filled up within minutes. At both ports, the ferry boats waited patiently in a row, like a taxi stand. 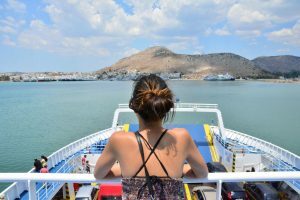 A one-way ticket to Salamina from Athens’ port of Perama is one euro per person. Yes, one euro to a Greek island! Crossing the waterway from Athens to Salamina island turned out to be a historic experience. The cool calm waters were the scene of one of the most strategic game-changing battles of ancient Greece: the Battle of Salamina. This was a naval battle fought in 480 B.C. It was a war between a pact of Greek city-states headed by Themistocles against the Persian Empire under King Xerxes. Although heavily outnumbered, the Greeks won. 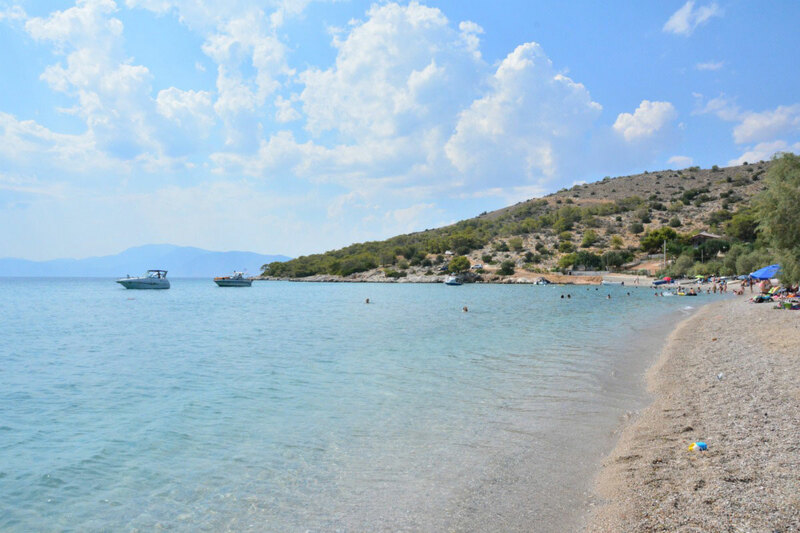 Salamina island is ringed with beaches and many locals advised us that the southern beaches were the best to visit with limited time. 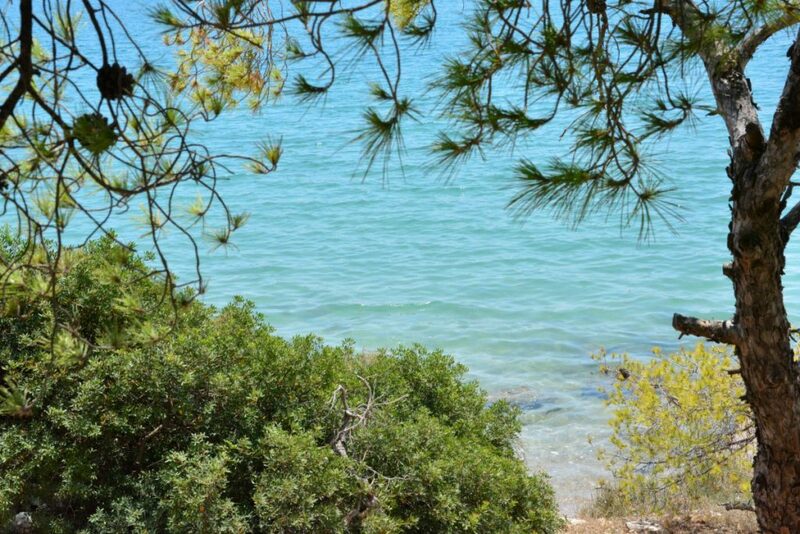 If you are visiting Fanoromeni Monastery you can have a dip at the northern beach called Psili Ammos. It was packed with families thanks to its really shallow waters. Along the way, there are many small beach coves with turquoise waters. We also took a small break at pretty Iliakti, which was a small beach cove. 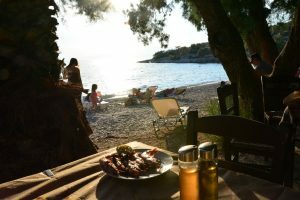 After checking out the highlights of the northern part of the island we settled into the beach scene of the south, finding shade under a tree in Kanakia, a sandy pebble beach with a calming view of a little Kanakia island in the distance. Other favorite beaches for locals include the lively beach resort strip at Aeanteio, and the southern beaches of Selinia, Saterli and Kaki Vigla. Tip: The ride from north to south of the island takes you through a pretty lush beautiful forest with fantastic views — a 30-minute drive. Agios Nikolaos district, named after the central church, has a series of impossibly charming seaside cafes and bars. 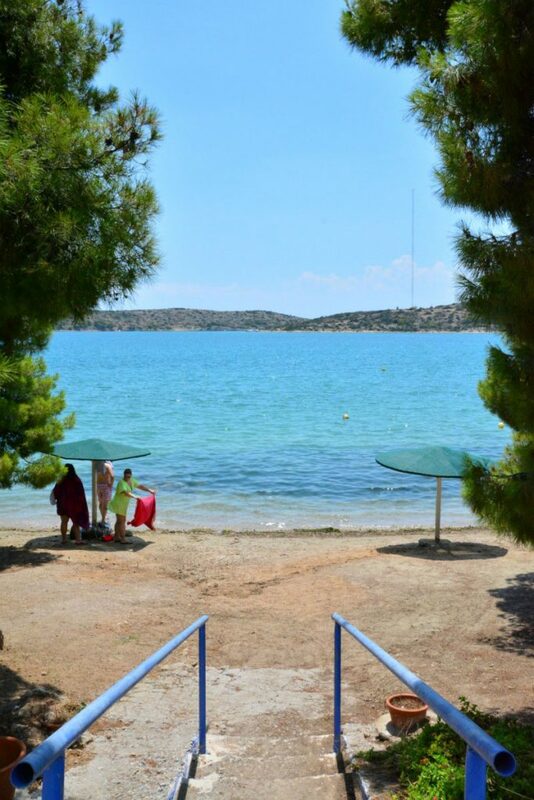 A wonderful place to enjoy turquoise sea views and a summer breeze with a cool drink. Faneromeni Monastery is located on the northwest coast, once the hiding place of Greek freedom fighters during the Greek Revolution. It is known for its icons and its fine 18th-century frescoes that depict the Last Judgement of Christ. 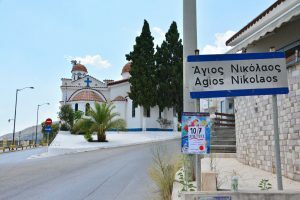 Other well-known churches are Agios Nikolaos Kalyvitis and Agios Dimitrios. 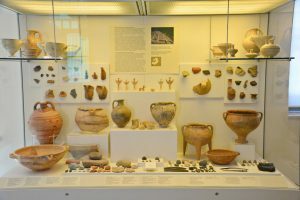 The Archaeological Museum of Salamis features relics from the Prehistoric Age to the Early Christian period. 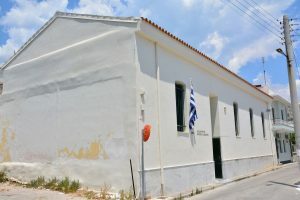 Located in city hall, the Folk Art and History Museum features local costumes, agricultural tools, cermics, ship models and paintings by Aristidis Glykas. The Maritime Museum is a small outdoor museum exhibits cannons and torpedoes. 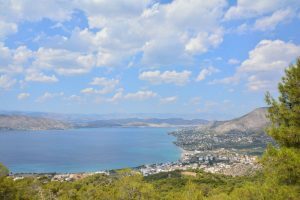 The ancient port of Salamina was built back in the 4th century B.C. in Ambelakia, the island’s oldest village. It is where the ancient battle of Salamis took place. Here’s where you can grab this shot of the famous sculpture commemorating the battle. 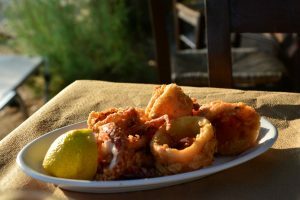 Due to the fact that Salamina doesn’t cater to many tourists, the tavernas are known for pleasing local expectations and that includes offering nicely priced authentic Greek meals. 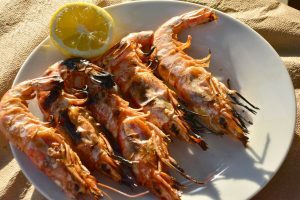 Friends familiar with the island recommended Karnagio and Bakothanassis for excellent quality and excellently priced seafood. We ate dinner at the fish tavern on Kanakia Beach. Absolutely delicious with a calming beach view to match. During sunset we had to stop on the way back to Paloukia to take in the amazing sunset on the coast of Aeanteio beach overlooking Salamina Bay. Stunning. The Cave of Euripedes is located near Peristeria beach. 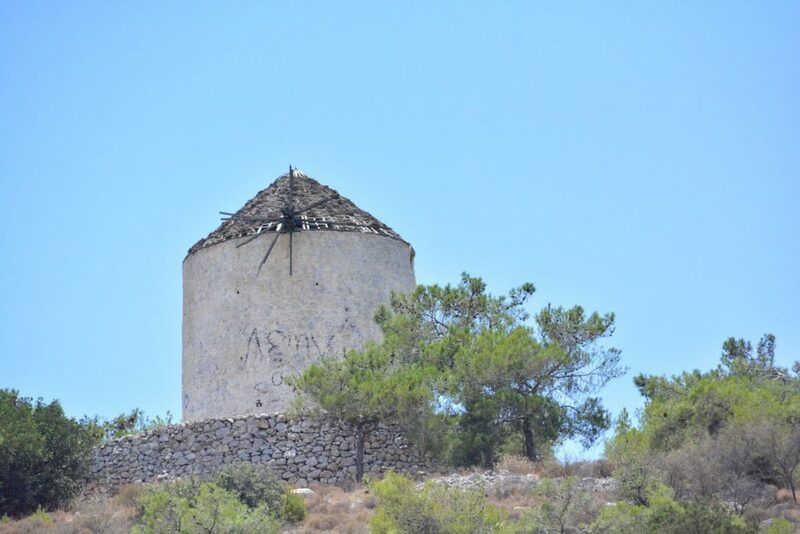 Like other Greek islands, Salamina has a few historic windmills located on the road heading from Agios Nikolaos to Psili Ammos beach or Faneromeni Monastery. According to Greek mythology, the name Salamina (Salamis) was given by Kychreas. It was the name of his mother Salamina who was one of five daughters of the river god Asopos. 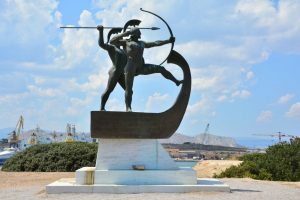 The great Battle of Salamis took place between the modern route of Perama and Paloukia in 480 B.C. The Battle of Salamis is considered one of the most significant battles in human history. A Persian victory would’ve stopped the development of ancient Greece. It’s the cheapest one-way ticket to a Greek island per person: one euro. When the ferry pulls into Paloukia’s port you’ll notice a lot of Greek navy boats. There is a navy shipyard here. Salamina has a large maritime community and you’ll find many boats set up for repair along the coast. To get to the Greek islands, many international travelers arrive by air and land in Athens or another major city. There are some direct seasonal flights to certain island destinations too. 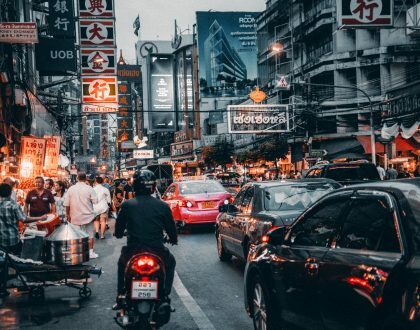 You can find the best flight deals with Vayama. You can get to Salamina from Athens via ferry from the port of Perama (in Athens) to Paloukia (on Salamina). There’s a car ferry every fifteen minutes. The ride is 15 minutes long. Ticket per person is 1 euro, cars are 2 Euro, motorcycle 1 Euro. There are also several car ferries traveling from the port in Piraeus. The ride is 40 minutes. 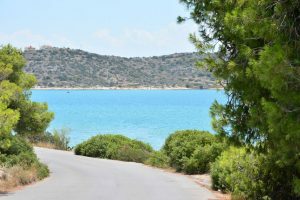 For the most effective use of your time, a day trip to Salamina island is best if you have access to a motorcycle or car. The island is spread out like a sprawling suburb, and nice scenic drives are possible through the center of the island. Due to the fact Salamina is not a “touristy” island, you won’t find shuttle buses to get you where you want to go easily. I recommend booking a car through Avis Europe. 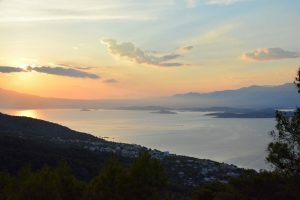 If you’re interested in visiting other Saronic islands, check out my other posts about Aegina, Agistri, Hydra and Poros. As I noted earlier, there aren’t many hotels on this island. Greeks come to their summer cottages here to spend the weekend. The island does not really cater to tourists. You can ask around for rooms to rent, but I don’t know what condition they will be in. 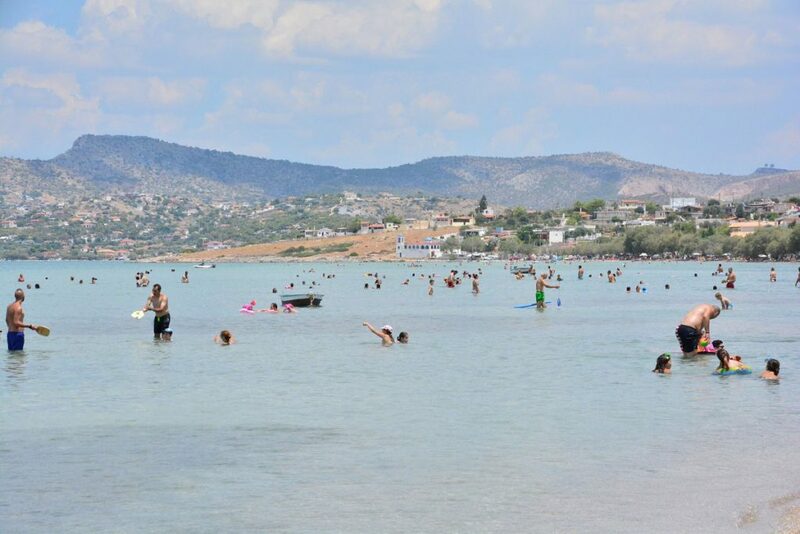 It’s not a famous Greek island, so would you like to take a day drip to Salamina? Why? Hi Amber, Thanks so much. I think you’ll like the authenticity of it all. The beaches are quite relaxing indeed. I can’t remember how many times I’ve gone past Salamina on the ferry between Piraeus and Aegina. 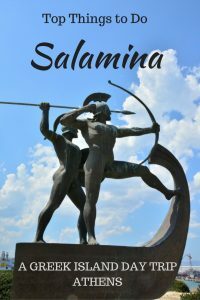 Because of your piece, my next trip to Greece will include a trip to Salamina. 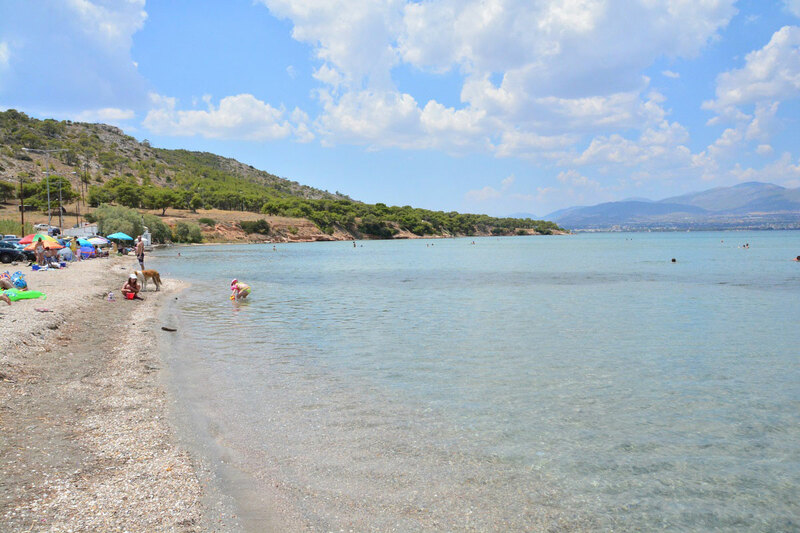 Non-touristy, authentic – and with great fresh seafood – Salamina looks like a great little find as a day trip from Athens! Hi guys, Thanks for stopping by. It is a neat little day trip. Definitely non-touristic and authentic as it gets when you think of Greek islands near a metropolis such as Athens. Love these pictures, definitely want to go here now! Hey Tay, It is great for people like you who love undiscovered places! I was really surprised by how beautiful it was. It really isn’t an advertised island at all. Greeks I speak to don’t think it is special. I think it is great for a day trip to a non-touristic place for sure. We’re considering renting an apartment here for September and/or October. Will the weather be hospitable? Hi there, Yes, I think the weather is best in September actually! October it is usually still quite warm but temps fall a bit — still beach weather for many folks. 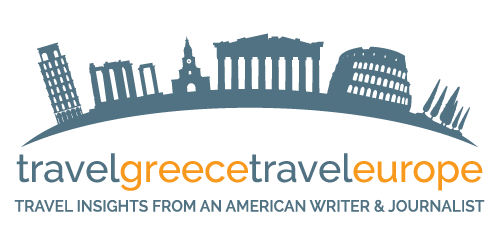 Will it be your first time in Greece? So curious how you chose Salamina for a long-term prospect! It’s not a very known island. Have to return to this island after 30plus years. It looks beautiful and inviting. It is pretty! A simple and really off-the-beaten-track island to explore. I hope you come back soon! Do you Know if it’s easy to Get a cab on Salamis? Hi Renate, Oh, glad you like it. It is a different calm kind of island. Very pretty. There are cabs waiting when you get off the ferry boat. Depends on the crowds that day. If anything, you’ll need to wait a bit but you can find one. Thank you😊 Do you know if the restaurants are open this time of year? I’m going to Athens, Kallithea, tomorrow! Do you have another place I can contact you? Need some restaurant advice to! Hi Renate, You can email me at [email protected] !! I am not sure if you left. Happy to give you my advice. 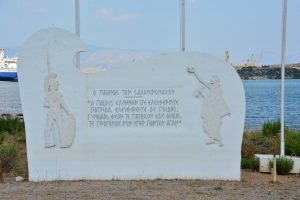 We spent three days on Salamina from the 9th to the 11 May. Your web site was so helpful in planning the trip – all the information that you have was spot on. 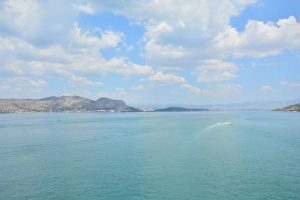 We arrived by the 1 Euro ferry from Perama, but returned with the ferry boat to Pireas (only costing 2.80 Euro) as it is easier to connect to the airport transport from here (the X96 bus). We stayed in a guest house called the Saronic Citadel situated on the hillside at Kaki Vigla area. I can recommend this 4 bedroom villa. The owner (Harris) will fetch you from the port, and he will also arrange for car hire as the house is quite remote and you need transport if you want to explore. Oh thanks so much for this amazing feedback. That is great. I am really glad my post helped you and that you had a nice time there. Great advice re: the ferry and thanks for informing all readers here about the Saronic Citadel. Sounds like it was a great stay. So glad you enjoyed. 🙂 Thanks for reading the blog. Hoping to go this summer..Where is the closest beach when you get off the ferry? Looking for a beach close to port. 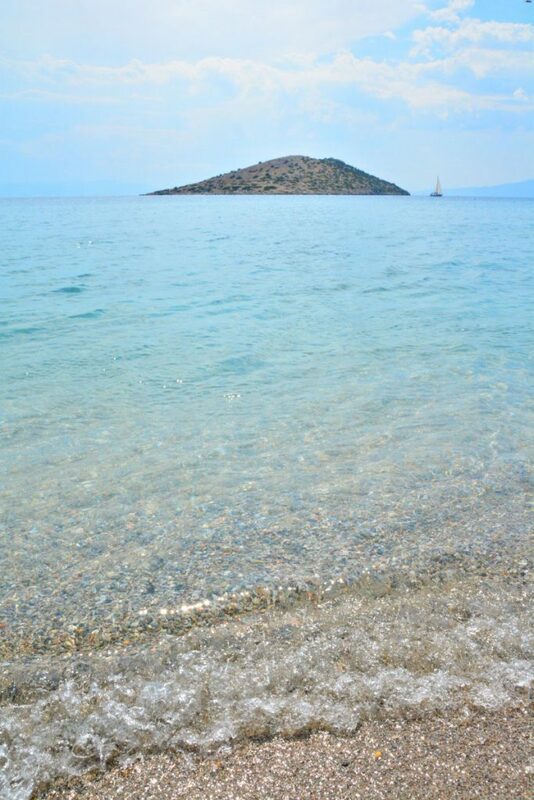 Hi Tamara, Psili Ammos is a nice beach that is closest to the port. Enjoy! Thanks so much! We will be sure to check it out! Hi! So glad to hear that. I hope you have an amazing time in Salamina. I really enjoyed my day trip there. We are currently in Salamina and a lot of the beaches are litered with rubbish. We walk most places and the rubbish is also along the roads and coastline. The seaside cafes at Ag. Nikalaos have liter strewn all over the sea front. Very disappointing and nobody seems to notice it. Restaurant food was below average. I will never stay here again.